Show your support and raise awareness of this important day by distributing this poster throughout your workplace. 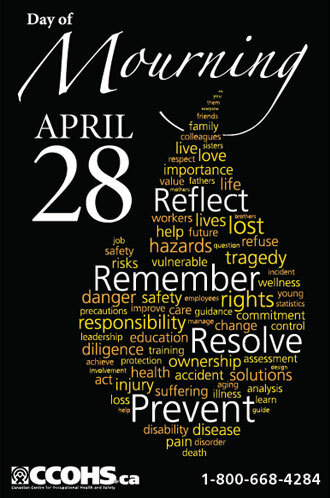 This poster can be seen in two ways - as a teardrop to mourn workplace loss, illness and tragedy, and as a flame to symbolize the ongoing journey towards safe and healthy workplaces. This poster is printed double-sided, with English on one side and French on the other. Matching Day of Mourning pins and stickers are also available to help commemorate this National Day.